The Publisher and Editor have retracted this article  in accordance with good ethical practices. After a thorough investigations we believe that the peer review process was compromised. The article was published on-line on 31-12-2014. 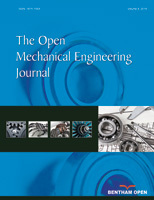 Z. Li-Guo, “Measurement and analysis of logistics energy efficiency in china from perspective of total factor productivity”, The Open Mechanical Engineering Journal, vol. 8, pp. 624-629, 2015.